We were on our way home from visiting the Carlsbad Flower Fields when a tweet came across my phone. Fast Food Maven was announcing $1 shakes at a new shake stop at the Block at Orange named Karl’s Shakes. Intrigued, we swung by on the way home for some tasty frozen treats. We were quite set on picking up the $1 sample shakes, but when we walked in, we were greeting by a Cold Stone style wall of various flavor combinations. I didn’t make it much past “PB&J” before it was quite clear we were not getting out of there for less than $5. Now, on the upside, a regular shake is less than $3, putting it in line with other shake offerings at The Block, such as Johnny Rockets or the recent Haagan Daz addition. So we ordered up three – for SCIENCE! The little one had this tasty S’mores number, which came dolled up with a cute little Teddy Graham and mini Hershey bar. She reports it was “awesome”. David had a “Kustom Kreation” of M&M’s and York Patties – similar to a shake he used to get all the time down at Limelight Java in Huntington Beach, except without the coffee. David reports it was not as good as Limelight, as the shake was a bit watery. I’m going to have to agree. I like my shakes just this side of ice cream, and on that criteria, these did not hold up. However, it’s also hard to find places that serve unusual shake flavors, and I like the Cold Stone style of ordering, so they get some points for that. I got the “Morning Karpool” which does have coffee AND Ghiradelli chocolate – also thin, but tasty. Final verdict – if money’s no object and I’m in the mood for a pretty straightforward mocha or PB and chocolate shake, Haagan Daz is still going to win me over, but I’m already planning on going back to try some more wacky flavors (still need to try that PB&J) and hoping for a thicker shake experience. Thanks for leaving such a detailed review of Karl’s Shakes! This is (as far as I know) probably the first review we’ve ever gotten, so that’s very exciting for me. I’m very happy you enjoyed the shakes and noticed that we take great pride in the presentation of each and every one of our signature creations. I also really appreciate your honesty in explaining the parts of your experience which can be improved. 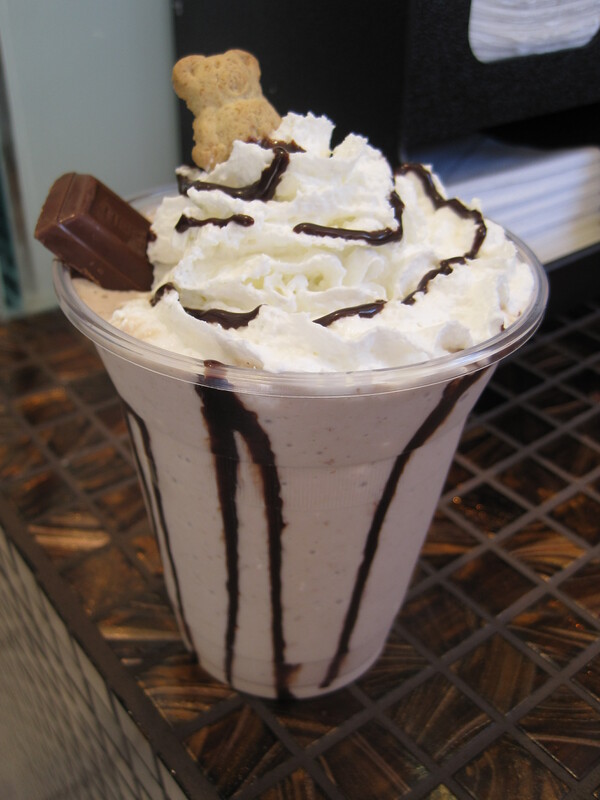 Our shakes are completely made to order and the consistency can be adjusted depending on our customer’s personal tastes. By talking to shake lovers all over the country before starting this business, I discovered that people have different criteria for what makes a perfect shake. Many people find it frustrating when they have to wait for their shake to melt before being able to drink it through a straw. Others prefer being able to dig right in with a spoon until the consistency is thin enough to drink. No matter what your preference, we encourage you to let us know so that we can meet your expectations each and every time. Of course we can make shakes as thick as our competitors, but we also believe that it’s the little things that count. For example, we use completely organic milk from a local California dairy farm, 100% pure fruit purees blending the finest and ripest fruits from all over the world, premium chocolate from Ghirardelli and other world renowned chocolatiers, offer 3 flavors of whipped cream made fresh on site daily, and offer prices below those of our direct competitors. 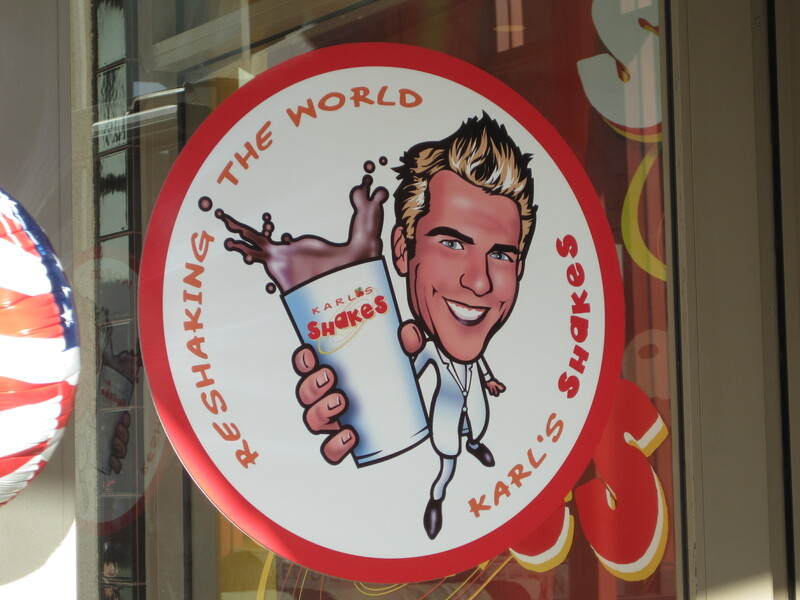 I’m confident that your expectations will be exceeded upon your next visit to Karl’s Shakes, and I hope to see you again soon. You’re welcome on the review/feedback! We’re always happy to give a shout out to local places, and you have an interesting concept going. We will absolutely come back and give the PB&J and maybe a couple others we missed a try. I’m on the thick shake end of the spectrum, so I’ll ask for that next time.